Page last edited 2012-03-08 17:01:03 (version 4). 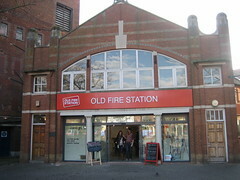 The Old Fire Station is an arts venue including a theatre, club venue, café, and shop. The café is run by Crisis, a national charity for single homeless people. Last edited 2012-03-08 17:01:03 (version 4; diff). List all versions.